This actually sets the tone for the rest of the film, as the band is coerced by their bitchy, kinda homely producer Lavinia (Maria Cristina Mastrangeli) into finding “a big hit, one that will sell millions”. Off goes sole male of the group Daniel (Pascal Persiano, who we’ll get to in a bit), who does a secretive cash handoff in an atmospheric gutted dockside warehouse with a batsh*t crazy Donald Pleasance (in one of his final roles) for a piece of music that it’s implied will fill the bill – an original copy of an unpublished ditty by legendary Georgian era violinist Nicolo Paganini, an odd looking fellow who drove audiences, and women in particular, to hysterical excitement with his virtuosic mastery of the instrument. Think of him as the original Beatle, except for one thing: like Robert Johnson after him, he was reputed to have “sold his soul to the devil” for his talent (a typically overwrought expression of jealousy and admiration applied to many a musician and artist in what were obviously much simpler times). Now here’s where things get funny. First off, the piece is kind of slow and boring – hardly Paganini’s stock in trade. While he was never considered even approximate to a top tier composer in any respect whatsoever, Paganini WAS known for putting to paper and performing some of the most difficult and speedy pieces ever created for the instrument, with a typical metronomic setting of allegro con molto brio, if not presto. So how such a sleepy, overly muzak oriented piece is supposed to be an original Paganini stretches credulity even more than what next transpires. With piece in hand, Daniel returns to the studio with his priceless parchment of music (literally – he’d have been better served selling this at auction at the Italian equivalent of Sotheby’s, they might have actually snagged themselves a fortune instead of a bad song out of the deal) and plays this sub-Barry Manilow snoozefest on piano. But of course, if nothing further than for the sake of moving the film along at due pace, they all LOVE it. After giving a brief but nonsensical aside that “oh, wait, we can’t record this! It’s not an original, even though it is public domain!” (Huh? ), the rest of the band proceeds to gush about how this is exactly the hit they were looking for. Umm…yeah. Now let’s take a step back, and introduce the members of our band. First we have Rita (Luana Ravegnini), a drop dead knockout of Italian beauty if there ever was one, on bass. Sadly, her screentime is cut short at an early stage. Then there’s blonde Elena (Michel Klippstein) on guitar – still pretty damn cute, and with a killer body (just wait till you see her in a skirt…or better yet, in that skintight PVC/spandex outfit during the video shoot. Madonna mia, what a rear view! But once again, she’s dispatched long before we’d prefer. Then things get a bit weird. Because when the film opens, we’re shown that Daniel, the sole male in the band as noted earlier, is their drummer. He’s also, for some ungodly lapse in taste, apparently balling the harsh and acid-veined manager Lavinia (thankfully only noted in the dialogue, we’re spared any such terrifying spectacle). But as it turns out, he’s merely their session drummer, because he will only appear in the video in a mask and costume (“remember, I’m under contract to another label!”). Further, he’s clearly able to read music and play the piano with some proficiency (remember the scene I described a paragraph back?). HUH? Let me talk to my fellow musicians out there. Outside of Yoshiki from X Japan, how many drummers do YOU know who are musicians in a proper sense (reading music, playing a non-percussion instrument, composing)? Yeah, I didn’t think so. So anyway, the band doesn’t “really” have a drummer. OK. Unfortunately, they also don’t have a front woman. Well, they have a woman, and she sings. But this is hands down one of the harshest women ever to take the lead in an Italian cult film of this or any other era. I mean, if the rest of the band appears to be in their early to late twenties, she easily looks to be pushing 40. If the others have pleasantly Italianate features calling to mind hints of the likes of Loren, Lollobrigida, or even Ornella Muti in some respect or other, she looks more like a low grade domestic of a culture I shan’t name (no need to unfairly paint an entire demographic in the poorly reflected light of one woman’s homeliness): pop-eyed, severe, and with little to recommend her in any aesthetic sense – she can’t even rock the crazy skin-baring 80’s metal style outfit she wears for the latter portion of the proceedings. She’s not even much of a singer, nor does she have any great shakes in terms of personality (which often excuses nature’s lesser sins) – in fact, she looks like a close relation to Lavinia, who actually comes out looking good by comparison in their scenes together! So after seeing Pleasance climb to the roof of the highest local building and toss away all Mark’s money to the wind (giggling some nonsense about “little demon” greenbacks flying away to do the devils work), we’re introduced to the second biggest name of the piece, Italian horror diva and co-writer of the film Daria Nicolodi (in one of her last performances for decades), who is renting her “haunted house” to the band for their video. Now, let’s talk about the video. Remember back when the girls were getting all worked up over Mark’s shady purchase, and how this’d be the big smash hit they were looking for? Well, in one particularly crazed bit of throwaway dialogue, we were informed that they would procure the services of “a real big time director” who would make them “a true showcase of horror…just like Michael Jackson and that wonderful video for Thriller!”. So in other words, mystical impartation and implication is given to Jackson’s admittedly enjoyable, but quite tame and mainstream zombie/werewolf extravaganza of a few years earlier, despite Jackson’s being a Jehovah at the time, and slapping that silly warning at the start about how it “no way endorses any belief in the supernatural” after a few airings. And somehow, comedy oriented A-lister John Landis (best known for such fare as Animal House, Kentucky Fried Movie, Three Amigos and the Blues Brothers) has morphed into “a master of horror” on the strength of one rather jokey foray into the genre (American Werewolf in London). Umm…yeah. So anyway, this “maestro di orrore” Mark (Pietro Genuardi) starts his video shoot. In true 80’s style, we get plenty of establishing shots involving mannequins veiled in gossamer scarves (you had to be there, I guess), some welcome focus on Elena’s posterior, and a little more of Rita, who’s positively dazzling in blue, despite being saddled with one of the worst hand me down puffy sleeved, crinoline waisted “please don’t show my body” dresses I’ve ever had the misfortune to see. The stomach turns a bit during all the shakycam pursuit of singer Kate (Jasmine Maimone), but one is unsure whether that’s more due to Cozzi’s poor handling of the camera during this sequence or the fact that it’s focused on the person in question. Notice the empty drumset, as if to display in big neon letters for all to see, “LOOK! WE DON’T HAVE A DRUMMER!”. A typically 80’s “fantasy sequence” (again, you had to be there for all this) involves Kate wandering through a half-finished construction site (great job nailing up that sheetrock around the doorframe, guys!) until she enters a room filled with candles set up in a meaningless X pattern, with a gilded coffin in the center. On top of the coffin are a gilded violin, a knife in the form of a treble clef (how clever!) and a parchment contract, which she helpfully reads to the audience as being signed by Nicolo Paganini “and Satan”. Satan has a problem signing his name apparently, as his name is underscored by a formless splash of red paint…I mean blood. Ooh, scary!, as Count Floyd would intone. The parchment promptly bursts into flame, and Daniel, dressed in a cape and hat ala Baron Blood, but with a much sh*ttier mask, jumps out of the coffin clumsily, knocking the violin aside without a care (no concern for precious objects, I tell ya…) and stumbling out to corner and gorily stab our heroine to death. End of shoot. Rita briefly reappears in a demure but inviting full coverage white lace number to lure Daniel upstairs, where he somewhat disappointingly just gets knocked upside the head (given all the gory and occasionally inventive demises peppered throughout the rest of the film, this is a pretty lame choice). That’s it for Rita; from here on out Daniel starts appearing to lure the survivors to various dooms. After this, things start moving fast and furious and stop making any semblance of sense. Holes in the floor, electrified handshakes, rooms with scary mathematical formulae and invisible walls…who the hell knows. In one chilling scene sure to strike abject terror into the hearts of viewers everywhere, we’re given a close shot of a framed picture of (gasp)…Albert Einstein! The horrors! Essentially, and without giving away the ending, from Rita’s demise on out, the film turns into one of those standard “hysterical girls wandering around a house scaring themselves” movies so popular at the time. But still in all, the Nicolodi influence on the script becomes apparent, as a major plot point revolves around the correlation between higher mathematics, music and the fabric of existence as manipulated by magick – a fascinating idea similarly postulated by John Carpenter’s intriguing Prince of Darkness (1987), a theorem that would seem to be increasingly corroborated (in a correlative sense) by deeper explorations into theoretical physics and the workings of the universe – or if you prefer, tying the accepted wisdom of the ancients to the most up to date explorations of theoretical science and mathematics of the present. So maybe that scary photo of Einstein isn’t so damn funny after all, eh? Ooo-wee-oooo…. In terms of the DVD itself, it comes to us from German label Camera Obscura, who has an unfortunate tendency to severely limit their releases and/or only sell from a small number of sites at initially high asking prices. Factor in exchange rates, shipping, or the necessity to purchase off greedy eBayers who think every piece of junk they own is a diadem of solid gold, and you have to really reassess what you’re getting relative to the price you’re expected to expend. And in this light, their efforts, while worthy, just don’t measure up. Suffused with grain and a sort of digital artifacting marked by black pixelation in the darker interior or night scenes that comprise the entire second half of the film, and boasting only one lengthy if amusing extra, an hour long discussion with Cozzi about his career, we come to a bit of a conundrum: do we commend the company for lavishing what would be a welcome amount of care and attention into releasing a film that has been unjustly derided by critics and aficionados since its release nearly 25 years ago? 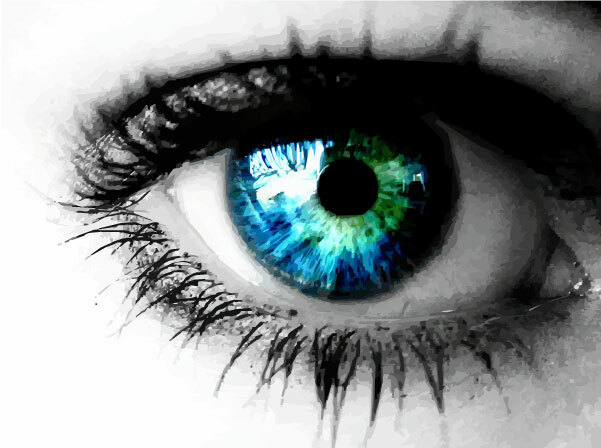 Or do we weigh the relative value of the end result against the rather dear final asking price for their products? In the end, this proved to be among the last, if not the last foray into filmmaking for three of its principals, each of whom had a reasonably substantial career behind them: Cozzi, Nicolodi and Pleasance. One is sorely tempted to postulate whether that was saying something about the project, but with an end result this entertaining (and which, like the still-buried in licensing hell Black Cat aka Demons 6: De Profundis, which MGM/Starz is once again responsible for sitting on… Sure, it can be viewed but not owned, if you’re a Netflix streaming type. But from the rest of the world, f**k you both sideways, and let someone put this final unreleased Cozzi film out on DVD already! ), it just doesn’t seem appropriate. While no masterpiece of filmmaking, it’s a whole hell of a lot of fun, pun intended. 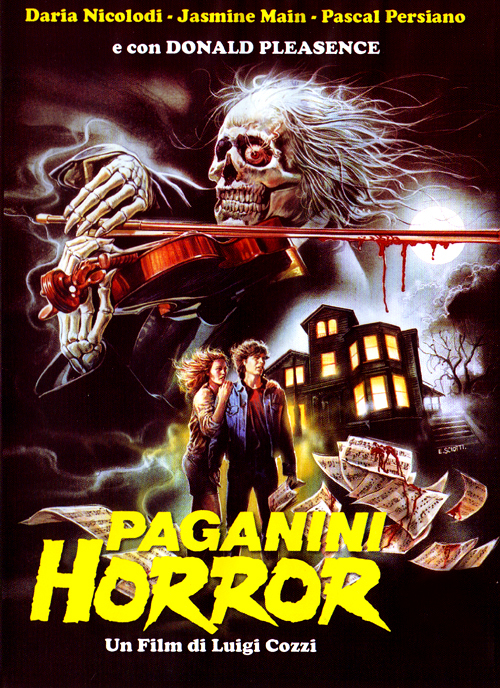 Financial concerns aside, Paganini Horror comes very much recommended.